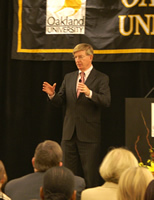 George F. Will participated in two lectures at Oakland University on Thursday, Oct. 26. He held a student session in the afternoon and a public lecture in the evening. 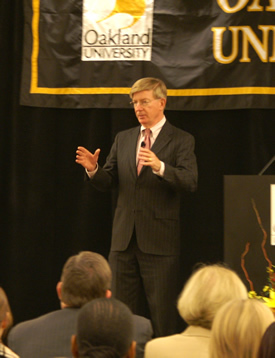 George F. Will is a Pulitzer-Prize winning newspaper columnist and best-selling author. According to Will, he writes to support his baseball habit. A die-hard Chicago Cubs fan, Will includes many baseball analogies to reinforce his political arguments. Will participated in two lectures at Oakland University on Thursday, Oct. 26. He spent time with OU students explaining how to be successful in writing, and later in the evening he shared his political views during the College of Arts and Sciences Distinguished Lecture in the Humanities. Will’s political commentary, syndicated by the Washington Post, can be read in approximately 500 newspapers around the world; as a contributing editor of Newsweek magazine, he offers insightful essays on the American way of life. Will won a Pulitzer Prize in 1977 for newspaper commentary. He also became a popular face on television as a founding panel member of ABC’s program “This Week.” Will has published seven collections of his Newsweek and Washington Post columns, as well as three books on political theory. He has also written two best-selling books on baseball. During Will’s evening lecture in the Oakland Center Banquet Rooms, he told the audience he would talk until he found something happy to say. He addressed social security, health insurance, the economy, Wal-Mart and gasoline in a presentation riddled with baseball references. “People say there is no bipartisanship in America, but there is a strong bipartisan agreement to ignore these problems,” Will said. Will said the economy is not as bad as people imagine, instead it’s better. Products are being made more cheaply and with less labor, which is a feat of innovation and ingenuity. “Unemployment is 4.6 percent today, yet Americans are unhappy,” Will said. Another thing Americans are unhappy about, said Will, is the price of gasoline. Will encourages the government to allow United States citizens to take ownership in things like medical coverage through programs like health spending accounts and social security, so they are less dependent on the government for everything. Will said there is no other society like the United States and Americans must give up the idea that they can change the world to think like they do. “We have lost sight of the miracle our society really. It took us a long time to get here,” Will said. OU students had the opportunity to listen to Will and ask questions of him during his afternoon lecture about becoming a successful writer. Will’s biggest piece of advice — read. He said books are the drivers of political conversation. “I don’t think I’ve done my job if at the end of a year I don’t write at least a dozen columns on books,” Will said. Each morning, Will gets up at 5 a.m. and takes his dog, Madison, on a four mile walk, listening to books on tape. He also listens to books while he shaving and driving to work. Will said he didn’t read much except bubble gum cards and sports section of the newspapers until he was in his early 20s, but now he keeps a log and requires himself to read about 86 pages of a book each day. During the students’ lecture, Will addressed North Korea and the relation to United States policy, new media, the war in Iraq and the news coverage of it and political journalism. Summary George F. Will is a Pulitzer-Prize winning newspaper columnist and best-selling author. According to Will, he writes to support his baseball habit. A die-hard Chicago Cubs fan, Will includes many baseball analogies to reinforce his political arguments. Will participated in two lectures at Oakland University on Thursday, Oct. 26. He spent time with OU students explaining how to be successful in writing, and later in the evening he shared his political views during the College of Arts and Sciences Distinguished Lecture in the Humanities.